Wait, you thought we were talking about Finn? I mean, he is very cool and all. But no, we’re talking about the other guy. Just a warning—incredibly mild spoilers about a minor part of The Force Awakens follow. Star Wars fans have a knack for pouring unabashed love over characters in the films that look cool, but are present for a handful of minutes at most—look at the adoration of Boba Fett in the original trilogy for example, despite the fact that he spends the vast majority of his limited screen time being wildly incompetent. The Force Awakens is no exception, all though the adoration this time is for someone who is actually kind of cool: the riot control stormtrooper and his fancy stun baton. He has a single line and is present in the movie for about a minute or two at most. But this ballsy, foolhardy stormtrooper who goes toe to toe with a lightsaber-wielding Finn has spawned fan art, memes, and even earned himself the nickname “TR-8R” in reference to his single line: angrily calling Finn a traitor to get his attention. And yes, he’s got toys! A cool little action figure, Lego, Pop! Vinyls, you name it, and this fella has turned up as it, ready to swing his baton with pride. And now, he’s getting the Hot Toys treatment. 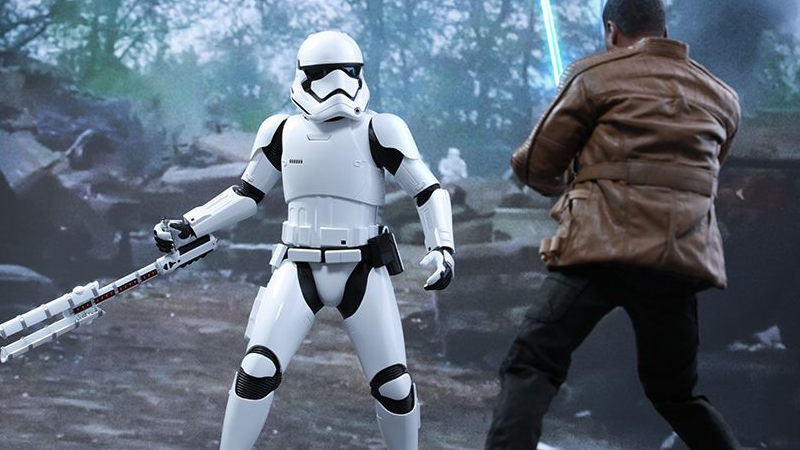 The Riot Control Stormtrooper is available exclusively as part of a bundle with Hot Toys awesome new Finn figure, depicting John Boyega’s Stormtrooper-turned-Rebel hero as he appears out of his trooper armor for much of the film. Finn comes with the jacket he borrowed from Poe, a set of alternate hands, the blue lightsaber formerly owned by Anakin and Luke Skywalker, and a large blaster rifle, for the moments you don’t want him swinging a laser sword around like the badass he is. The trooper, however, is similar to Hot Toys’ previously revealed set, only this time as well as a blaster rifle they come with a bonus shield and stun baton, to allow you to recreate the brief duel between the stormtrooper and the former stormtrooper from the film. You have to admit, he does look pretty cool. No wonder he has an ardent fanbase already. The Finn and Riot Control Stormtrooper bundle will be available in August of next year, as will the standalone Finn figure. They’re available to preorder in the US from Sideshow Collectibles now—the bundle will set you back $360, the standalone Finn $205. It’s an expensive time to be a Star Wars fan.